The entertainment apps and mobile games have become a lucrative market for Pakistani developers. The mobile apps has a huge customer base in country and over the last couple of years Pakistani games have gain immense visibility in software developers industry. Software studios like Pepper.pk are top Pakistani developers for BlackBerry’s Appworld where as Pakistani developed games like Ninja Fruit Bash and TenPearls won 2011 Nokia and AT&T Innovators contest. Groopic app for photographers, developed by Lahore Based developed by Lahore-based start-up Eyedeus also gained a success and coverage by top media like CNN. 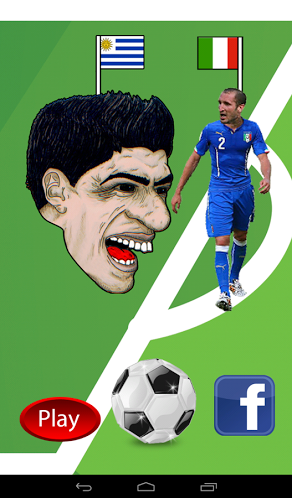 Suarez Bit Me is another hit by Pakistani Game Studio (DreamWorld Technologies). The game is based on recent incident during a FIFA Worldcup 2014 match when Suarez bit his opponent . The game can be downloaded freely from following this link. This game is a fun and addictive game, and is aimed towards players of all ages. “Suarez Bit Me” is based on the real life incident of a famous football player by the name of Luis Suarez who recently bit his opponent Chiellini during a FIFA WorldCup 2014 match and received a ban of 4 months. The developers have added a very funny touch to the game making it super interesting and fun to play. The game is absolutely free to download for anyone who has an Android device. The game features animated characters of Suarez, Chiellini and the Referee. The player must bite as many opponents as possible. The player is dead hungry, and he will be given a Red card by the referee every time he bites an opponent, but he must still continue on his biting spree. At the same time, he must avoid biting the referee because then he will be banned permanently and the game will be over. How much can you score? Well let’s see what you got. And the best part, the game also features Sharing with your Friends on Facebook! !